Can I clone email views? What are calendar email and event email and what's the difference. In your calendar and event email, a list of practices and phrases to avoid. Why people may not be receiving calendar and event email and how to fix it. How to send one-time or recurring emails that contain sets of events. If events change, you can opt to keep recipients informed. How to add and customize a calendar email view. How to customize the Classic calendar email view. How to customize the List calendar email view. Brand email with a custom banner and privacy/unsubscribe section. Edit the recipient list, change the schedule, or cancel the email altogether. Learn how calendar time periods determine which events get sent. By default, visitors can subscribe to calendar email. You can turn that off. How to set up and send event announcements and reminders. How to set up the recipient list for an event email. How to add and customize event email views. How to add, import, edit, delete, group, and export contacts. How to import plus troubleshooting tips. You can use email in connection with your published calendars to inform people about, invite them to, and remind them to attend upcoming events. In addition, when calendar visitors use event actions, such as Forward to Friends, Email Me Event Information, and Notify Me of Changes, they receive event email messages that you can customize to reflect your brand. Customized calendar email message that lists upcoming events. 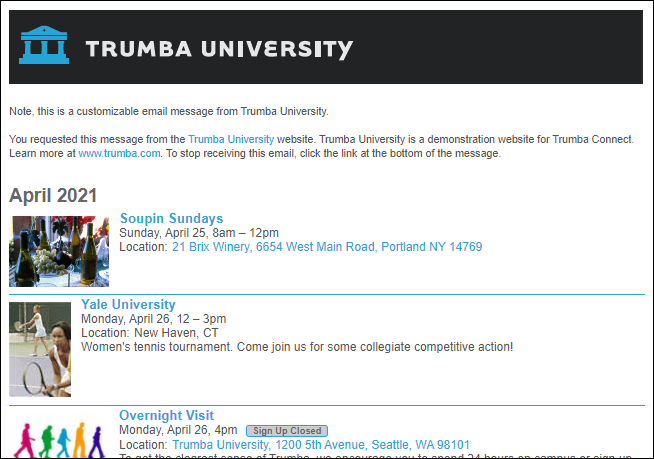 Tip Every Trumba® email message includes an opt-out link in a customizable footer.